Doty & Sons' new environmentally friendly Model RP2844 with Two Way Recycle Dome incorporates 490 one-gallon recycled plastic milk jugs in the slat sides and 88 recycled glass bottles in the concrete base. Special two-way dome accepts cans and bottles. Recycle signs available to designate recycling entry. A 44-gallon inner liner is included. 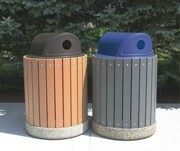 A choice of dome colors and aggregates is available. Visit the Web site to view the complete line of concrete site furnishings. New StarGuard® is a complete line of main drains, frames and gates for commercial aquatic swimming pools and facilities. Pentair Commercial now has drains that meet ASME/ANSI A112.19.8a-2008 safety standards as well as the Virginia Graeme Baker Safety Act. The new StarGuard® main drains can be combined with Pentair's popular IntelliFlo® or IntelliPro® VS+SVRS pump, which provides facilities with the ability to reduce operating costs while simultaneously adding a layer of safety protection for end users. StarGuard® main drains are available in black and white and a range of sizes. 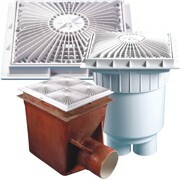 SeaKlear PRS is an EPA-approved clarifier for trapping Cryptosporidium in pool and spa filters. SeaKlear PRS works to enhance filtration down to 0.5 micron, effectively trapping Crypto, E. coli, Giardia and algae in the filter. This patented technology works by enhancing a filter's ability to remove particles that are too small to be trapped by the filter alone. SeaKlear PRS has a WQA Gold Seal approval as well as NSF 60 certification, allowing its use in recreational water facilities in Florida and other markets that require these standards. Action Floor Systems has added NitroPanel, a quick-assembly, panel-based portable floor to its line of premium hard maple athletic floor systems. The NitroPanel Portable Floor System is a high-quality, durable sports surface that delivers excellent performance characteristics, and features a beautiful surface deck of MFMA grade-marked Action LL (long length) northern hard maples. Expansion Ridge Technology accommodates expansion incrementally, board to board, offering strength and uniformity. Via SignsTM join the current Via Series, which includes the Portal, Wayside, Crossing, Gateway and Nested Shelters. Via SignsTM combines a comprehensive design package of digitally imaged or laser-cut signage, powder-coated steel, and frame and anchor options to provide signs for parks, athletic complexes, amusement parks, waterparks, commercial and residential developments, health/education facilities and more. PorterCorp is now offering digitally imaged high-pressure laminate exterior signage with full-color graphics, which includes a 10-year warranty. They also offer laser-cut and powder coated steel for two-color artwork. ERC Wiping Products Inc. offers presaturated Equipment and Surface Wipes as a beneficial, low-cost and effective solution to keep your sports clubs, health or fitness centers safe and clean. The 9-by-7-inch wipes are manufactured using the same formula as other leading brands. The wipes are packaged two rolls to a case with a total of 900 sheets per roll. Equipment Wipe rolls conveniently fit into all dispensers including bucket, wall mount, stainless steel and other style floor dispensers. Fair-Play's new wireless scoreboard controller systems are 100 percent guaranteed. Fair-Play offers to provide all parts of a direct-wired control system free of charge if any problems arise with wireless operations. With the Fair-Play Wireless Scoreboard Controller System, scoreboards within the same facility can operate from independent controllers or one main controller. Controllers can be configured to operate the other wireless scoreboards in their facility or even other facilities. The controllers include program settings for multiple sports, and as opposed to channels, the wireless system utilizes a grouped list of controller numbers.